Orchids were the darlings of the Victorian era growers. Over one hundred years ago, crazed collectors could not get enough of these new, elegant, tropical blooms. The large exotic blossoms of the Cattleya orchid have been especially prized through the years, as the orchid of choice for those special corsage giving and receiving occasions. These days, breeding has made the plants much smaller and more windowsill friendly. This selecting and hybridizing makes it possible for the modern day gardener to grow orchids on windowsills. Orchids have entered the mainstream of flower culture. These alluring plants now grow as easily as African violets. Most tropical orchids are epiphytes, air plants that cling to trees in their steamy home ranges. Orchids only use trees for support. The orchids are not parasites, but derive their nutrients from the rainwater, air, and debris that filter down through the leafy branch-tops of their host trees in their natural habitat. Because of this growing pattern, they are grown at home in tree bark specially formulated for orchids; not in soil. Some cling to open wooden baskets or slabs of bark. You might find some orchids for sale growing in a peat-based media. Since peat holds water, this can lead to overwatering by an amateur grower. Water needs to flow through the pot. Roots cannot stand to be kept wet. They rot. So-called orchid bark is still the best medium for most orchids. Healthy orchid roots are bright white and often climb out of the pot. This is normal. If the whole plant starts to go over the edge, then it's time to transplant to a larger pot. The bark mix also degrades over time, creating a problem with drainage. It breaks down into soil-like compost, compacting and holding too much water. Most orchids need repotting every couple of years; two to three years is the recommended length of time between potting. Orchids also require a high humidity environment, higher than found inside most homes. To add moisture to the air, add a humidifier to the growing area. Or, you can mist the plants every day. You can also supply extra humidity by setting the pots of orchids on gravel in plastic or glass saucers. Keep water in the gravel but below the level of the pot bottom. Water should not touch the pots. As the water evaporates from below, it envelopes the orchids with the humidity these plants love. Fertilization is important. There is very little nutrient value in bark. A 20-20-20 water-soluble fertilizer is adequate. Look for one especially formulated for orchids, containing the micronutrients they need. The rule of thumb is to feed weakly, weekly. They should be fed while they are growing, which varies with the plant. A timed-release fertilizer is not recommended because orchids need to have a rest period. Withhold fertilizer when growth stops. Do let them rest. Orchid plants benefit from a summer vacation outdoors. They can be hung from tree limbs. Putting them directly into sunlight would severely burn the foliage. The Cattleyas and Dendrobiums can move into filtered sun as they acclimate to the outdoors. The Phalaenopses do just fine in more shade. Shade tolerance is one of the reasons they do so well inside homes. Don’t put orchids outdoors until the night temperatures outside are above 50 degrees F. They can take some temperatures a little lower than that, but that seems to be the safest temperature. If your garden is wildlife friendly, insect eating birds will supply a never-ending insect patrol, searching through the bark, often throwing it on the ground. Consequently, you might need to add more bark when the plants move back indoors, but you can do away with insecticides. In fact, there are not many insects or diseases that strike orchids, another reason for growing them. Move the orchids back inside when the nighttime temperatures are dropping to fifty again. Morning sunshine, humidity, and cool indoor temperatures are all that’s needed to keep the plants happy and blooming in the windows indoors. 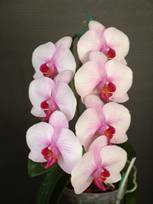 Orchids enjoy temperature fluctuations between daytime and nighttime. This actually boosts the bloom. In order to keep all of the flowers facing forward, position them facing the window light until all of the buds open. If you turn the plant, then your buds will turn back toward the light. You’ll have some buds going to the left and some going to the right. You really want Phalaenopsis and Dendrobium blossoms falling in rows and the other orchid flowers all facing forward. When the last bud opens, then it is safe to turn or move the plant away from the light. A Phalaenopsis (commonly called a Moth Orchid) would be the orchid to take home first. They are so easy, they can even be purchased in super markets and home improvement stores. Cattleyas, the corsage orchids, are not too difficult to grow. The biggest difficulty is getting enough winter sunlight so that they will set buds and bloom. A blue Ascocendra, ‘Princess Misaka’ (a Vanda hybrid) might have been the first blue orchid. It hangs out in an open wooden basket with no potting medium at all. To water it, carry it to the sink once a week, immerse it, and let it soak for twenty minutes. Another unusual favorite is a Brassia, a spider orchid. One called ‘Witch Doctor’ throws out long spikes with pale, spotted, spidery shaped flowers along the stem. Oncidiums hold unusual small yellow and brown flowers on wiry stems. The commonly called Dancing Lady only needs to be seen to understand the name. Many enthusiasts find they cannot stop with just one plant. One hundred years ago, this was called Orchid Mania. Today, orchids offer a challenging, rewarding, engrossing grower hobby. Got an empty windowsill?